Streax Colorgard Shampoo with Color Radiance Lock. This post would be interesting for people who use HAIR COLOR very frequently since its about a shampoo specifically for coloured hair - Streax Color Guard Shampoo. I know most of us color hair these days but I am not one of them. I avoid colouring my hair often since I already suffer from quite a few hair problems like dryness, split ends, hairfall (Read Tresemme Hair Fall Control Shampoo Review) and would never want to add more to it. I have colored my hair very few times till now so I never thought of using a hair color shampoo. While buying things online last week, my friend requested me to add one Streax Colorgard Shampoo if available online. I accepted her request and this made her so happy since she was searching for this shampoo since long. Out of query, I went ahead to ask her if she loved this Streax Shampoo so much, to which she replied not too much but quite a lot. Being interested more on this product, I asked her about her experience on this and decided to do a review on this based on the things told by her. 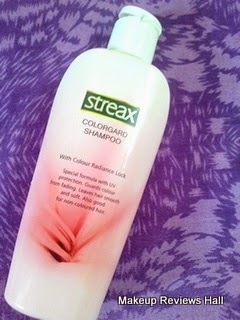 So here is the review written by me on this Streax Colorguard Shampoo on the basis of my friends experience. What Streax ColorGard Shampoo Claims? Streax Colorgard Shampoo with colour radiance lock has been specially enriched for coloured hair. Leaves hair smooth and soft. Streax Colorgard Shampoo with UV protection formula guards hair against sun's harmful UV rays, prevents fading of hair colour and improves hair texture and appearance. Price - Rs 40/- for 100 ml. This Streax ColorGuard Shampoo comes in a cute white bottle with red shade in front making it look more cute with the contrast. The bottle comes with a simple flip cap, quite easy to open but little difficult to close. The shampoo is white in color with a creamy consistency slightly on the thicker side. The fragrance of this is quite likable and I don't think anyone would dislike it. On application, the shampoo lathers well and is very mild on colored hair. It cleans away the dirt and oil completely without leaving any harshness back. This is really good about this shampoo that it makes colored hair soft and smooth and also retains this softness. Now coming to how much it does in preventing fading of hair color? Well I don't think it works much in this, but definitely helps in retaining the softness of colored hair and preventing it from getting dry because of chemicals. Read Park Avenue Beer Shampoo Review. Overall this is average to good shampoo for colored hair depending on the hair type. If you frequently color hair which makes your hair dry, then you should definitely try this shampoo at least once to make hair your hair soft and prevent it from color damage. Recommended How frequently should you wash Hair? Retains the softness of colored hair. Reduces the damaged caused by hair color. Mild on hair with mild fragrance. People with hair problems like split ends dandruff should not try this.